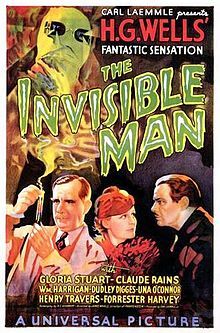 Just as Dracula and Frankenstein were based on novels by Bram Stoker and Mary Shelley, respectively, The Invisible Man (1933) was based on a novel written by H.G. Wells. James Whale is on hand to direct another Universal Horror classic that is considered not only one of the best horror movies of the period but also one of the best movies overall for 1933. The groundbreaking special effects remain largely convincing today, although high definition is exposing some of the wirework that was previously hard to spot. However, it’s a small price to pay for what is visually an amazing print. The Invisible Man has never looked as good. Claude Rains made his first American film appearance as our lead character, Dr. Jack Griffin, and it remains one of his most famous roles. This is even more impressive when one considers he’s only on screen for the last seconds of the film. He carries the movie with his voice alone but what a voice. It’s hard to imagine another actor achieving the success Rains did with his performance. The opening moments of the film actually find our story mid-stream as Dr. Griffin has already suffered the accident that led him to be invisible. Now, he’s desperately trying to find his way back to visibility. The first segment of the movie is priceless as Dr. Griffin is making his way through a snowstorm to small village inn, where encounters the quiet and suspicious stares of everyone in the pub. However, it’s to be expected considering he’s bandaged and covered from head to toe. He demands a room from the innkeeper. Enter the hilarious Una O’Connor as the innkeeper’s wife, Jenny Hall. She is in top form with her over-the-top expressions and crazy screaming. Once the locals have enough of his demands and mad scientist ways, a confrontation leads to Dr. Griffin stripping off his clothes to reveal…he’s invisible. Henry Travers (the angel Clarence in It’s A Wonderful Life) is Dr. Cranley, an associate who is in search of Dr. Griffin along with Griffin’s jealous partner Dr. Kemp (William Harrigan) and girlfriend Flora (Gloria Stuart, The Old Dark House and Titanic). Along the way we see brief glimpses of other familiar faces, such as Dwight Frye as a reporter and John Carradine as a local. A countrywide pursuit leads to a final confrontation trapping Griffin in a barn, forcing him to flee straight into the police, who shoot him. As he dies in the hospital with Flora by his side, he regains visibility and Rains finally is seen on screen as our movie ends. The movie is beautifully filmed and enhanced by a stellar cast. No surprise that it would eventually spawn a series of sequels, although none that directly picked up on the same storyline. In The Invisible Man Returns (1940), a young Vincent Price turns in an early horror appearance. The Invisible Woman, released the same year, is really more of a comedy. Invisible Agent (1942) puts a patriotic war twist with Peter Lorre playing an evil Japanese agent. The Invisible Man’s Revenge (1944) wrapped up the serious movies with Abbott and Costello Meet The Invisible Man (1951) officially ending the series. All of these movies are entertaining, with the only exception being The Invisible Woman, which was a little hard for me to sit through. This new Blu-Ray release is amazing but a little skimpy on the extras when compared to the other films in the set. We get the original documentary released almost a decade ago, which is very entertaining, but that’s it. This one minor complaint aside, I rank this as another mandatory viewing for the season. Even by 1941, Lon Chaney was a legend in Hollywood. His makeup skills were inspiring future generations and gave us modern-day artists like Tom Savini and Rick Baker. While his son didn’t inherit his father’s makeup skills, he did leave his own mark on the horror film genre. Lon Chaney Jr. is the only actor who can claim to have played the legendary Dracula, Frankenstein monster, mummy and, the starring role in 1941s The Wolf Man. While considered by most to be one of the best of the Universal Horror films, it’s somewhat surprising that it never had its’ own sequel. From his second appearance in Frankenstein Meets the Wolf Man, our resident werewolf was sharing the spotlight with the other monsters on the block. 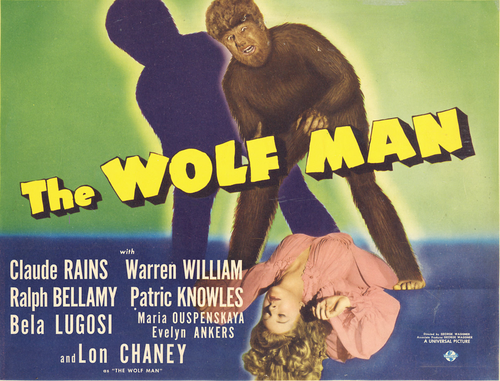 However, Lon Chaney Jr. can hold claim to be the only actor to have portrayed the Wolf Man, truly making the character his own. Lon plays our lead, Lawrence Talbot, who returns to his home in Wales following the death of his brother. He reconciles with his father Sir John Talbot, played marvelously by Claude Rains (The Invisible Man). He soon sparks up a romantic interest in Gwen Conliffe (Evelyn Ankers, The Ghost of Frankenstein) only to quickly be sidetracked after he is bitten by the werewolf, Bela, played by Bela Lugosi in a small but pivotal role. Maria Ouspenskaya appears for the first time as Maleva, the gypsy, and Ralph Bellamy rounds out our primary cast as Colonel Montford, hot on the trail of the murdering wolf creature. The movie is full of atmosphere with foggy moors and the ever-present town folk ready to roast evil alive if they had a bonfire. Lon would return as Talbot in 1943s Frankenstein Meets The Wolf Man opposite Bela Lugosi’s monster. It picks up years later after Talbot has been dead and buried only to have Talbot resurrected and once again on the prowl. This begins his quest to find a cure, somehow thinking Dr. Frankenstein’s journals would hold the answer. They didn’t and following a fight to the death with the monster, is thought killed. However, he didn’t die and came back in 1944s House of Frankenstein, this time sharing screen time with the legendary Boris Karloff. 1945s House of Dracula was same song, different verse but he managed to go out having a little fun with Bud and Lou in 1948s Abbott and Costello Meet Frankenstein. Sadly, his cure from House of Dracula was forgotten and the wolf was growling again. After this, our resident werewolf was laid to rest until the lackluster remake in 2010. Lon did don the werewolf makeup a few other times, including a 1959 Mexican horror film, La Casa del Terror, and a 1966 episode of Route 66. However, his Universal Wolf Man would forever be the role he is best remembered for. The new Blu-ray release is stunning, looking more crisp and sharp than ever before. A plethora of extras, as is the cases with all of the movies on the Universal Monsters Blu-ray set, makes this required and annual Halloween viewing. By 1932, Boris Karloff had already become famous as Frankenstein’s monster (Frankenstein), the crazy Morgan in The Old Dark House, and Dr. Fu Manchu (The Mask of Fu Manchu). So the time was right for him to add a mummy to his repertoire. 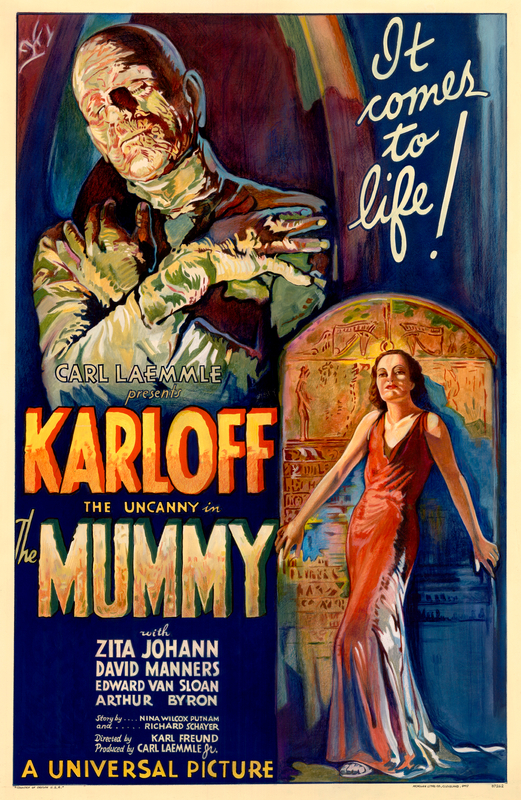 In fact, his star had risen so much in that one year, he was billed only as “Karloff” in movie posters for The Mummy. He would lead the cast in the role of Imhotep, the Egyptian priest who was buried alive for attempting to resurrect his beloved Princess Ankh-es-en amon. Once his mummified remains are discovered and accidently revived by reading an ancient scroll, the mummy regains human form as Ardath Bey. Bey is in search of his reincarnated princess, who just happens to be in the form of Helen (played by Zita Johann). Bey is eventually thwarted and turned to dust by a ray from the statue of Isis. Amongst the cast is now recognizable Edward Van Sloan as Dr. Muller. Van Sloan is essentially playing a role very similar to that of Van Helsing, whom he played in the previous year’s Dracula. Johann only appeared in 8 movies, the last of which was in 1986, 52 years after her previous film. Jack Pierce’s makeup on Karloff was very extensive and time-consuming. Karloff actually only appears as a mummy in the opening sequence but is very convincing. The rest of the film, he is the aged Ardath Bey and the removal of the makeup actually left his face burned, leaving a permanent scar. The flashback sequences were actually filmed to resemble a silent movie, adding an aged look to them. There was also extensive flashback sequences filmed that would have stressed the reincarnated princess through the ages. They were eventually cut and only stills from the sequences remain. This particularly upset Johann, who was a believer in reincarnation. Although there were five films in Universal’s mummy series, the last four were actually separate from the original. 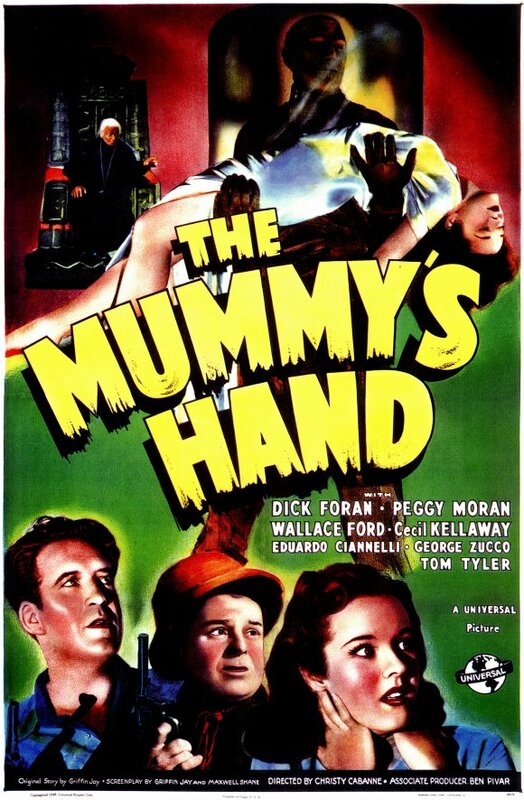 In 1940, a new series began with The Mummy’s Hand, which starred Tom Tyler as the mummy Kharis, the character featured in all four remaining films. However, stock footage from The Mummy was used in flashback sequences. This mummy is brought to life through tana leaves in search of his beloved Princess Ananka. Lon Chaney Jr. assumed the role for The Mummy’s Tomb in 1942, The Mummy’s Ghost and The Mummy’s Curse, both in 1944. Because of the extensive makeup, Chaney hated the role of Kharis, which admittedly left him very little to do other than shamble around. Finally, Abbott and Costello met the mummy Klaris in a 1955 film that was probably the least enjoyable of the various movies in which they met the monsters. Klaris was played by stuntman Eddie Parker, who had previously doubled for Chaney. His makeup was rather unconvincing and appeared lazily slapped together, somewhat indicative of the Abbott and Costello series by this point. The new Blu-ray is amazing with a much clearer soundtrack that is without the various hissing and scratches. Perhaps the best way to see how much improved the picture quality is on the Blu-rays are to pay attention to the footage used in the documentaries, which were on the original DVDs. Revisiting the mummy series was a lot of fun. The series did degenerate quickly but with latter films only an hour long, they are fun matinee flicks and recommended, while the 1932 original is essential viewing for any real monster movie fan. The 1920s and 1930s are when Universal Pictures gave birth to the first of their monster films. In the 1940s, we were given a plethora of sequels, ending with most of them meeting up with Abbott and Costello in 1948 to end the original era of Universal Monsters. But in the 1950s, after Universal Pictures merged with International Pictures, there was one more monster franchise to be unleashed. In 1954, Creature from the Black Lagoon gave us the last of the iconic monsters. It was amplified by being the second Universal film released in 3D, following the success of It Came from Outer Space in 1953. Our movie begins with the discovery of a fossilized hand in a rock base in the Amazon. Dating from the Devonian era, it could be a new link between creatures of the sea and land. Dr. Carl Maia (Antonio Moreno, The Searchers) reaches out to his friend Dr. David Reed (Richard Carlson, It Came From Outer Space and The Valley of Gwangi) and his girlfriend, Kay Lawrence (Julia/Julie Adams, lots of TV appearances through the 1980s including The Big Valley and Mannix). Rounding out our intrepid crew is the moneyman Dr. Mark Williams (Richard Denning, Target Earth and Creature with the Atom Brain), Dr. Edwin Thompson (the ever-present Whit Bissell, I Was a Teenage Werewolf and Invasion of the Body Snatchers amongst countless other appearances) and the captain of the steamboat Rita, Lucas (Nestor Paiva, Dark Streets of Cairo and Revenge of the Creature). We also have a few crewmen who might as well have worn red shirts based on the life expectancy. Once our team makes their way into the Black Lagoon, they’ve entered the playground of the Creature and, like any good slasher flick, they are picked off one by one. Jack Arnold directed and followed his pattern of excellent black-and-white cinematography and better-than-average scripts in some of his other films, such as The Incredible Shrinking Man and It Came from Outer Space. The real story behind this movie is the great atmosphere in the location and the absolute wonderful design of the Creature. Two primary locations were used in the filming. All underwater scenes were done in Wakulla Springs, FL while the lagoon was a standing lot at Universal Studios in California. The lagoon is still there, looking a little different than it did back in 1954 but still a legendary location in film history. Two actors would play the Creature. Ricou Browning did all of the underwater scenes while Ben Chapman performed the above ground sequences. Ricou returned for the two sequels that followed, Revenge of the Creature (1955) and The Creature Walks Among Us (1956) while Tom Hennesy and Don Megowan assumed the landside gill-man roles respectively. 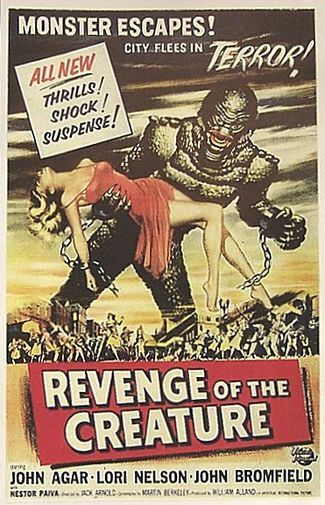 In Revenge of the Creature, the Creature is captured by John Agar and brought back to the mainland, where the Creature becomes as fascinated with Lori Nelson as he did with Julia Adams the year before. It also has the rare distinction of being the only 3D sequel. We also get the theatrical debut of Clint Eastwood as a lab technician and the return of Nestor Paiva as Captain Lucas. In The Creature Walks Among Us (1956), Jeff Morrow and Rex Reason are the two doctors who capture the gill-man and Leigh Snowden is the resident damsel-in-distress/love interest. Neither of the two sequels captured the fun of the original. 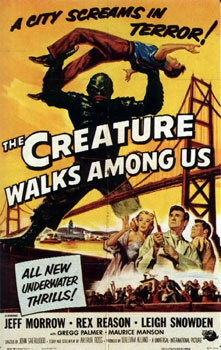 While the Creature seemed almost as deadly in Revenge, he just seemed out-of-place. By the third film, it appears that he is suffering the same fate on Frankenstein’s monster did in his later films. I have been lucky enough to see Creature from the Black Lagoon in 3D on the big screen back in the early 80s and Revenge of the Creature in 3D on TV in the mid-80s. Creature from the Black Lagoon was also the first horror VHS I purchased back in 1987 (the Goodtime home video version at Camelot Music). Creature from the Black Lagoon is one of my personal favorites, as evidenced by a poster on my movie room wall and the latest Diamond Select figure displayed next to it. The gill-man has often been depicted in varying forms through countless marketing campaigns and also holds the honor of being introduced on television through a cameo appearance with Abbott and Costello (although he never got his own movie with the comedy duo like his counterparts). The novelization by John Russell Fearn (writing as Vargo Statten) is a fun addendum to the trilogy if you still need a gill-man fix. The Blu-ray release gives us an amazing picture in anamorphic widescreen. This is a personal favorite of mine and something that should be on your shelf for annual viewings. Four years after Universal made Boris Karloff a big enough star he could go by his last name only, the Frankenstein saga continued with that rarest of things in Hollywood: a sequel that is better than the original. The Bride of Frankenstein is a classic in every sense of the word. Not only is it the best of the Universal Frankenstein series and one of the best Universal Horror movies, it is also considered one of the 100 best movies ever made. 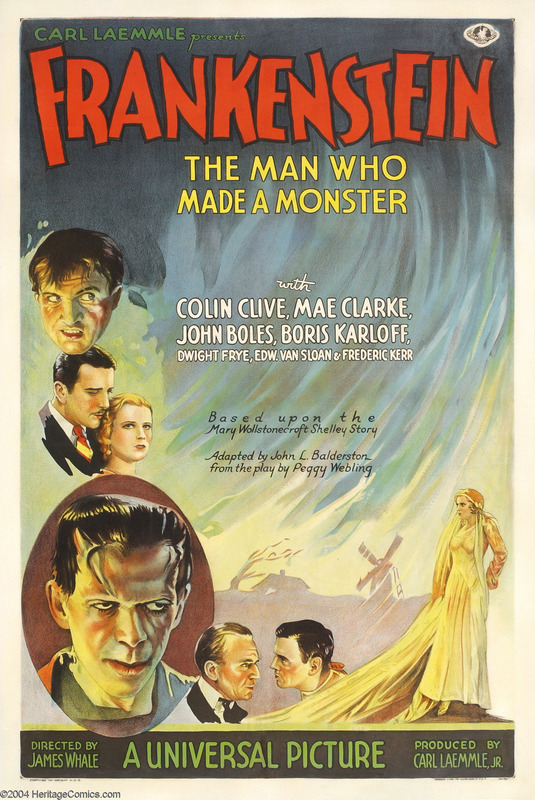 Boris Karloff as back, this time getting credited as the monster and only using the name “Karloff”. Colin Clive returns as Dr. Frankenstein, somehow saved from what appeared to be certain death off of the windmill at the end of Frankenstein. Valerie Hobson assumes the role of Elizabeth from replacing Mae Clarke. I personally preferred Mae Clarke’s performance but by 1935 she was no longer a lead actress. Ernest Thesiger (the undertaker from 1951s Scrooge) plays Dr. Pretorius as over-the-top as was legal. He is the quintessential mad scientist. Dwight Frye is back again, this time as Karl and things turn out just as bad for him the second time around. Una O’Connor (The Bells of Saint Mary’s) played Minnie, the old woman/servant who is absolutely a joy to watch. Her performance here is reminiscent of what she did in The Invisible Man. Sadly, Frederick Kerr, who played Baron Frankenstein in 1931, had died in 1933 and did not reprise his role. And we can’t forget Elsa Lanchester as both Mary Shelley in the prologue as well as the bride at the end of the movie. She puts in a classic performance that is an iconic image in the history of Hollywood. Watching both Frankenstein and Bride of Frankenstein back-to-back, there are lots of differences from one film to the next. The Frankenstein house in the village becomes a grand castle. Baron Frankenstein just disappears while Elizabeth has started seeing Death and appears to be in touch with the netherworld. Colin Clive ages a lot in that four-year gap. The fact he dies two years later from alcoholism comes as no surprise. 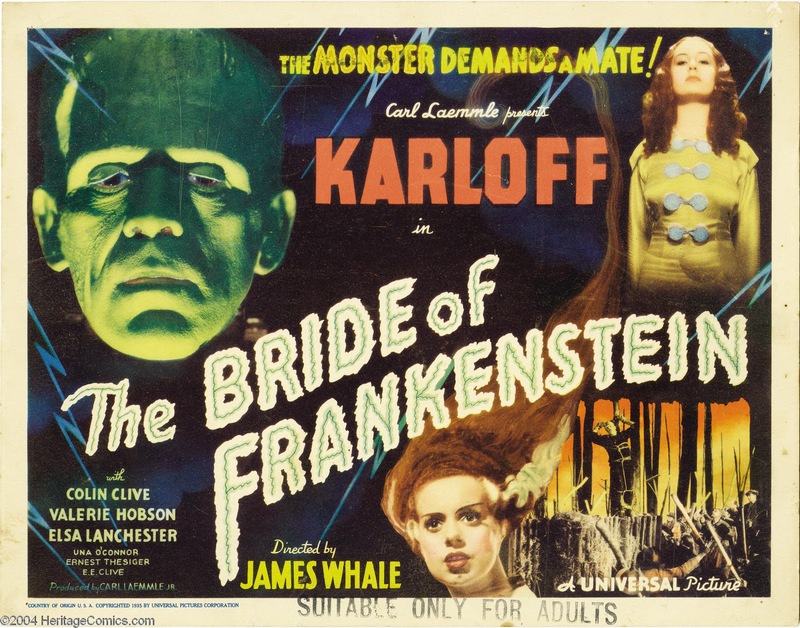 While the monster is one dimensional and full of hate in Frankenstein, you can easily sympathize with him in Bride. He’s brutal at times then so calm in others. He also now speaks and seems so lonely. And when he does find a friend, his tears of joy are heartwarming. The monster was at his peak here. 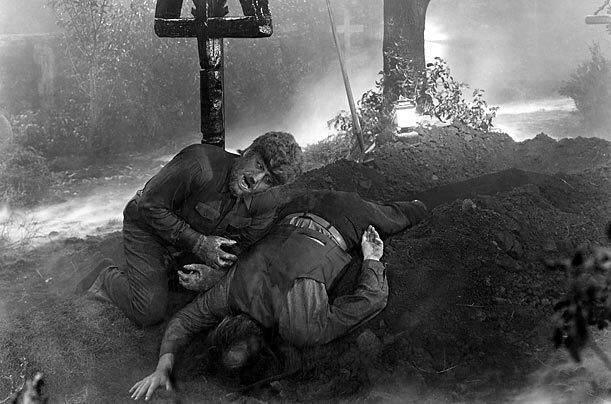 Karloff’s performance in Son of Frankenstein was more subdued, The Ghost of Frankenstein (Lon Chaney Jr.) and Frankenstein Meets The Wolfman (Bela Lugosi) saw him more as a monster than a man. And by the time Glenn Strange assumed the role in House of Frankenstein, he seemed almost an afterthought. The parts with Pretorius can be a little over-the-top at times but the fun factor is turned up a notch. The Blu-ray is stunning, even more so than Frankenstein. Another film that I’ve watched more times than I can remember. From this first viewing in the 1970s to the videotape I bought at Suncoast Motion Picture Company in 1989 to the two DVDs and now the Blu-ray, it’s a semi-annual Halloween event. Need I say it? Highly recommended! Growing up as a child of the 70s, my generation was the last to grow up without cable television. We didn’t get it until I was eleven years old nor did I have access to any UHF channels. There was only one TV station that would play movies on a regular basis and I was lucky enough that they would air some of the Universal Horror classics. I have fond memories of staying up late to watch Frankenstein and Dracula. 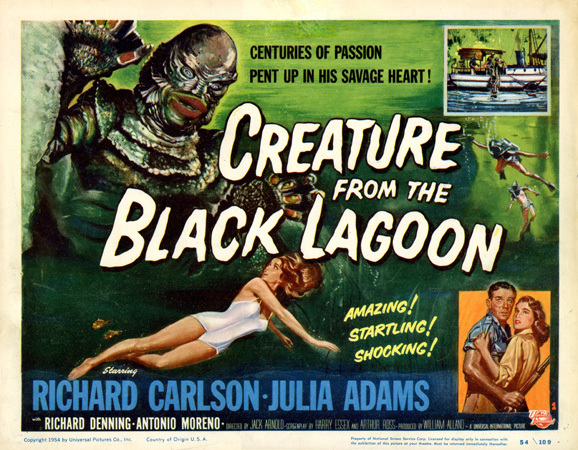 I also remember seeing Revenge of the Creature in 3D about a year before I was lucky enough to see Creature from the Black Lagoon in 3D on the big screen. Years later, I collected them on VHS, seeing many for the first time. I’ve also bought them on DVD, some twice, so when I heard they were being released on Blu-ray, I initially decided against it. However, as the reviews came in and the restoration sounded amazing, I was tempted. Finally, I saw the special coffin box set in the UK and when I heard it was not only region-free but half the price as the US version, I was sold. The restoration on Dracula was amazing and Frankenstein continued what I anticipate to be a trend with this set. What can be said of Frankenstein that hasn’t already said? Bela Lugosi made the mistake of his career by turning down the role. However, it made a star of Boris Karloff. Karloff is fantastic as the monster and his portrayal here is mostly horrific. It really isn’t until The Bride of Frankenstein that we truly begin to sympathize with him. Colin Clive plays Dr. Frankenstein in the first of two appearances. He’s a man on the edge, obsessed with solving the mysteries of life and death. In 1931, you see a young actor with a promising career ahead of him. Compare how he looked in ’31 to ’35 and you’ll see a man who ages quite a bit in just four years. Edward Van Sloan (Van Helsing from 1931s Dracula) portrays Dr. Waldman, who discovers what Frankenstein is doing and reluctantly agrees to help. Dwight Frye rounds out the primary cast as Fritz, the prototype for the evil hunchback man-servant. Everything we’ve come to expect from a mad scientist movie is present: a crazy laboratory, stormy nights, the unsuspecting wife/girlfriend, the friend who will go against the evil scientist to save the woman he loves. Frankenstein is just as enjoyable now as it was the first twenty or thirty times I’ve seen it. It’s amazing that I still see things for the first time. Like I’ve never noticed this was based on a novel by “Mrs. P.B. Shelley” or the large lump on the neck of Baron Frankenstein. I’ve watched Frankenstein about every other year and never grow tired of it. The fact that people are still going to a theater to watch it some 81 years later is amazing. And the Blu-ray? Well, it’s very impressive. It didn’t have the restoration Dracula received but it’s never looked better. Highly recommended. 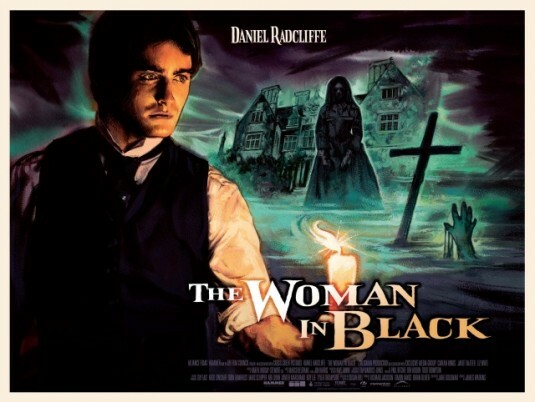 The true gothic Hammer horror film returned in 2012 with The Woman in Black, starring Harry Potter himself, Daniel Radcliffe. The danger of doing 8 Harry Potter films and growing up before the entire movie-going world is that some people will forever see you in that role. And I must admit, I had that same feeling while watching him try on his gothic horror hat. At times, all I could see was Harry. But at other times, I could see a fine, young actor showing respect to the material and the genre. Now, I must first admit that I’ve never read the 1983 novel by Susan Hill or the 1989 television film. So I went into this movie was a clean slate. Furthermore, we had a mature audience watching this film with my daughter and I back in February, so no disrespectful people talking through the movie. Add to that it was a huge grand auditorium with a balcony and you had a great atmosphere to envelope ourselves into the gloomy village and the ghost that went bump in the night. The movie is set in mid-to-late 1910s and centers on lawyer Arthur Kipps, played by Radcliffe, who is sent to remote village to finalize the paperwork of a now deceased client. We come to learn that his wife died in childbirth and this is his last opportunity to get his head back on straight. Upon arriving in a village, he might as well have been a vampire for the warm welcome he was given. And the house he needs to get to, known as the Eel Marsh house, is only accessible when the tide is low, which adds to the feeling of desolation. Once he arrives at the house, the ghosts awaken and the tension builds to one final night of answers and confrontation. The locations used required no CGI and immediately set the mood. Eel Marsh house couldn’t have been more haunted looking if they tried. It was hard to accept Radcliffe at first but as the movie progresses, he does a wonderful job. We also have Ciaran Hinds as Daily, showing he can act, something I questioned upon viewing his poor performance in Ghost Rider 2. Yes, we get some cheesy jump scares but we also get some very unexpected ones. And the overall creepy tone of the movie can put you on edge when this is watched in the right environment. The movie was moderately successful but enough to warrant a sequel. The all too common blood and gore was replaced with a gothic atmosphere that some younger moviegoers didn’t appreciate. However, The Woman in Black: Angels of Death is scheduled for release in 2014. We have a while to wait but I am curious as to how they plan to continue the story. The ending wrapped up the Kipps storyline well but clearly left the door open for more. The Blu-ray looks amazing and I highly recommend this for Halloween season viewing. It is currently in my top five list of favorite movies viewed at a theater this year.